The culture history at Arroyo Hondo Pueblo can be best understood against the broader context of the cultural sequence in the northern Rio Grande valley, which is the subject of this volume. The volume focuses on two main problems: (1) the extent of the Pueblo’s territory as indicated by the distribution of nearby, contemporaneous communities, and (2) the way the settlement and abandonment of Arroyo Hondo Pueblo relate to the general pattern of northern Rio Grande prehistory. It was assumed that to understand fully the cultural changes at Arroyo Hondo Pueblo, it would be necessary to have a fairly detailed knowledge of the regional system of settlement patterning before, during and after the period of the site’s occupation. This objective was approached through a field survey and research on previously recorded sites in the Arroyo Hondo area. The monograph describes the survey project and presents a stimulating model of the relationship between natural resource distribution and settlement change through time in the northern Rio Grande region. It provides valuable insights that allow the cultural and historical dynamics of the Pueblo to be seen as part of a larger regional system that includes environment, culture, and population. 1982 Review of Prehistoric Pueblo Settlement Patterns: The Arroyo Hondo, New Mexico, Site Survey, by D. Bruce Dickson. American Antiquity 1982: 911-914. 1982 Journal of Field Archaeology 9(2): 269-270. 1981 World Archaeology 13(2): 269. 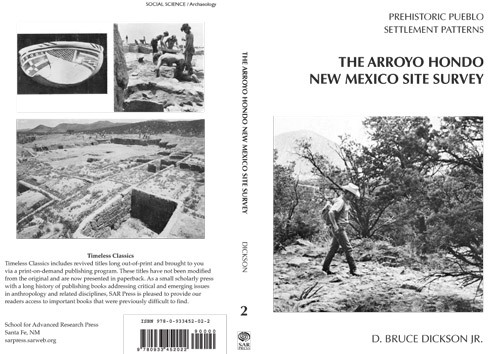 1981 Review of The Arroyo Hondo New Mexico Site Survey, by D. Bruce Dickson, Jr. The Artifact 19: 73-75. 1981 Review of Prehistoric Pueblo Settlement Patterns: The Arroyo Hondo New Mexico Site Survey, by D. Bruce Dickson. American Anthropologist 83: 927-929. 1980 Southwestern Bookshelf. New Mexico Magazine June 1980: 64. 1981 Review of Prehistoric Pueblo Settlement Patterns: The Arroyo Hondo New Mexico Site Survey, by D. Bruce Dickson, Jr. The Masterkey 55: 37-38. 1981 Review of Prehistoric Pueblo Settlement Patterns: The Arroyo Hondo New Mexico Site Survey, by D. Bruce Dickson, Jr. Books of the Southwest June 1981: 8.